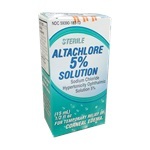 Hypertonicity Altachlore Sodium Chloride 5% ophthalmic solution in 15mL dropper bottle. For temporary relief of corneal edema. Manufactured by Altaire. NDC Number: 59390-183-13. Comes as singles. Compare to Muro 128. **THIS ITEM IS CURRENTLY ON BACKORDER. 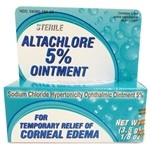 ** Sterile Altachlore Hypertonicity Sodium Choride 5% ophthalmic ointment in 3.5gm tube. Used in the treatment of corneal edema. Manufactured by Altaire. NDC Number: 59390-184-50. Comes as singles. 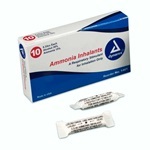 Ammonia respiratory inhalant contains 35% alcohol and 15% ammonia. Each ampule is 0.3ml. Manufactured by Dynarex. Comes 10 per box. Hydrogen Peroxide 3%, 16 oz. 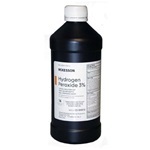 Hydrogen Peroxide 3% solution in a 16oz. bottle. NDC: 68599-2301-6. Manufactured by McKesson. Comes as singles. 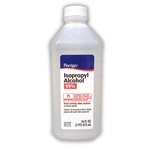 Isopropyl Alcohol 99%, 16 oz. **THIS ITEM IS CURRENTLY ON BACKORDER. ** 16 ounce liquid bottle of isopropyl alcohol 99%. Manufactured by Perrigo. Comes as singles. Isopropyl Rubbing Alcohol 70%, 16 oz. 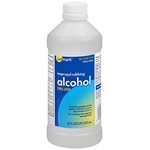 16 ounce liquid bottle of isopropyl rubbing alcohol 70%. Manufactured by Sunmark. NDC: 49348-0173-38. Sold as singles. 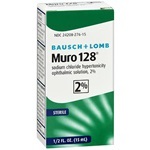 Sterile Muro 128 Hypertonicity eye drops. Sodium chloride 2% in 15mL dropper bottle. Manufactured by Bausch & Lomb. NDC Number: 24208-0276-15. Comes as singles. **THIS ITEM IS CURRENTLY ON BACKORDER. 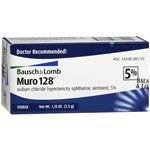 ** Sterile Muro 128 Hypertonicity ointment. Sodium chloride 5% in 3.5 gm tube. Manufactured by Bausch & Lomb. NDC Number: 24208038556. Comes as singles. **THIS ITEM IS CURRENTLY ON BACKORDER. 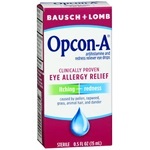 ** Antihistamine eye drops Opcon-A solution 15mL. Naphazoline HCL and Pheniramine Maleate are active ingredients. Temporarily relieves itching and redness caused by pollen, ragweed, grass, animal hair and dander. Manufactured by Bausch & Lomb. NDC Number: 10119002090. Comes as singles. **THIS ITEM IS CURRENTLY ON BACKORDER. 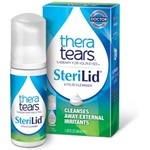 ** TheraTears SteriLid Eyelid Cleanser removes oil, debris and other irritants that can build up on eyelids and eyelashes. Comes in 1.62 FL oz. foaming pump dispenser. Preservative free. NDC: 58790-0005-50. Manufacturer: Akorn. Comes as singles. Tylenol extra strength 500mg capsules are used for pain relief. Capsules are white oblong pills. 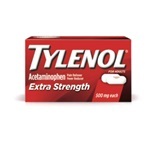 Generic drug name is Acetaminophen. Manufactured by Johnson & Johnson Consumer. NDC Number: 50580-0449-10. Comes 50 per box.